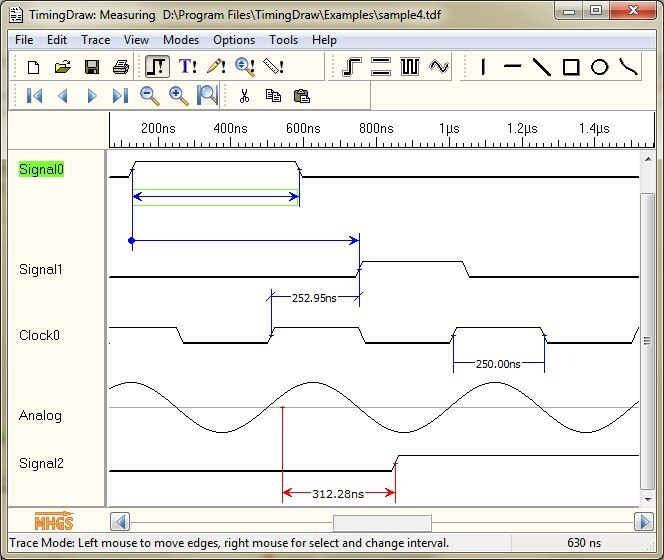 TimingDraw™ is a powerful editor for digital and analog timing diagrams with extensive features. TimingDraw allows designers, scientists, and students to specify and visualize timing diagrams. In contrast to other timing editors, TimingDraw has some outstanding features, for example quick edit functions. TimingDraw is world-wide the only editor, which is able to display both digital and analog signale. Intuitive Windows Graphical User Interface. Digital and analog signals supported. Analog signals (calculated by math formula or measured e.g. oscilloscope). Easy and interactive zoom/ unzoom by mouse wheel and mouse drag. Open remote projects on the internet. Graphics (arrows, boxes, circles, curves). Cut, Copy, Paste of traces and intervals. Insert and delete time spans. Save as Bitmap or Vector Graphic (EMF). Send timing diagrams via eMail. The TimingDraw Viewer is a free viewer for TimingDraw project files. More information about TimingDraw are available in our product flyer. The downloads contain a combined setup for Windows 32 and 64 bit. The full version of TimingDraw is available for 34.95 EUR in our Online Shop or directly from MHGS. TimingDraw is one of our award-winning software products.